When it comes to surviving sudden cardiac arrest, the quick response of bystanders can often save lives. 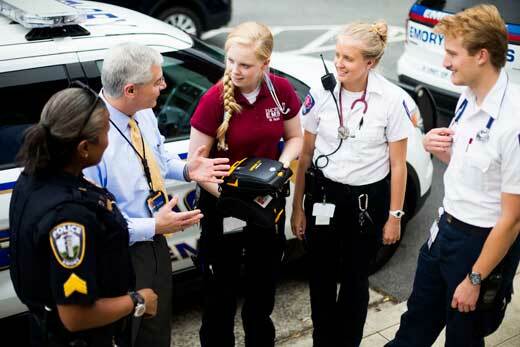 Sudden cardiac arrest (SCA) is the leading cause of death in the United States, claiming more than 380,000 lives per year across all ages, genders, ethnicities and geographic areas, says Sam Shartar, senior administrator for Emory’s Office of Critical Event Preparedness and Response (CEPAR). When it comes to surviving SCA, time is the enemy. In fact, studies show that the odds of survival are greatest when an automated external defibrillator (AED) is applied within three to five minutes of a witnessed collapse, Shartar says. To help enhance those outcomes, CEPAR is hosting a free CPR and First Aid Marathon from 9 a.m. to 3 p.m. on Saturday, Oct. 15, in the Student Activity and Academic Center (SAAC). Trainings will be offered through a series of stations where participants can learn how to perform chest compressions, use an AED, control bleeding, and become better prepared for campus emergencies. The entire training cycle should take no more than 45 minutes to complete. Preregistration is not required and free parking is available on the Clairmont campus in the Starvine parking deck. Event partners include Emory Emergency Medical Service (EEMS), DeKalb Fire and Rescue Department, and American Medical Response, who will assist with the trainings. Offered in connection with national Sudden Cardiac Arrest Awareness Month, the free training program is open to anyone within the Emory community, including students, staff, faculty and their family members. Participants will learn how to perform compression-only CPR and use an AED along with first-aid techniques for how to stop bleeding and use a tourniquet — all skills that “will better prepare you to save a life,” Shartar says. Additional information about how to prepare for unexpected emergencies will also be available. While the training does not include first-aid certification, it will provide basic foundational knowledge that could prove to be a game-changer in the outcome of an emergency, according to Shartar. “From a resilience standpoint, if you learn how to do compression-only CPR, how to use an AED, how to control bleeding with direct pressure, and how to use a tourniquet, those are skills that can allow you to save someone’s life, no matter where you are,” he says. Last October, CEPAR launched a program to boost the odds of SCA survival by installing 300 AED units in public spaces throughout Emory’s campus communities, including the main campus, the Oxford College campus, Midtown campus, Grady campus, Yerkes Field Station, and non-clinical Emory Healthcare facilities. Since then, Shartar notes, many campus offices, schools and divisions have requested training on the small, portable, user-friendly devices. He suggests that the CPR and First Aid Marathon will offer a good opportunity for campus work groups to select designated responders to receive basic skills training.